Sydney Collier and Wentworth. Photo (c) Lindsay Y. McCall. Jupiter, FL – December 17, 2014 – Horse Radio Network’s once-a-month Para-Equestrian Show wrapped up the 2014 competition year with Sydney Collier and introduced Western Dressage with guest Ellen DiBella. Lindsay McCall from the United States Para-Equestrian Association (USPEA) hosted the show with co-host and athlete Ellie Brimmer. 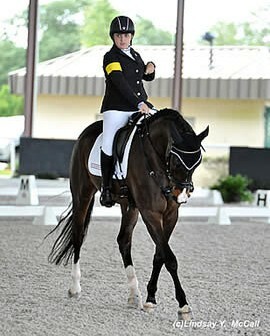 To listen to episode #289: http://www.horseradionetwork.com/2014/12/10/dressage-radio-episode-289-year-end-wrap-with-sydney-collier-and-western-dressage/. Sydney Collier was recently awarded the prestigious 2014 FEI Against All Odds Award. She was also named the United States Equestrian Federation (USEF) 2014 Junior Equestrian of the Year. About Sydney Collier: At age seven Sydney was diagnosed with Wyburn-Mason Syndrome after she began having blurry vision. Wyburn-Mason Syndrome is a rare, congenital disorder characterized by arteriovenous malformations in the central nervous system and retina. It affects only .14% of the world’s population and can cause brain hemorrhaging, stroke, paralysis, or death. 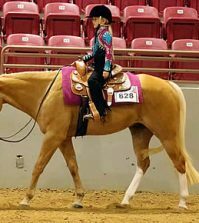 She enjoys bringing awareness to the disabled community and the Paralympic Equestrian sport through public speaking, dedication, and her riding accomplishments. In 2014 Collier earned a spot as a Grade Ib rider on the Alltech FEI World Equestrian Games U.S. Para-Dressage Team that competed in Normandy, France. She achieved strong scores on Victoria Dugan’s Willi Wesley, a 2000 Warmblood gelding. It was only four years prior at the 2010 World Equestrian Games in Kentucky where Collier met Paralympian Jonathan Wentz who introduced and then mentored her on the Paralympic sport. Through her positive attitude and determination Collier has garnered numerous accolades aboard horses Willi Wesley; NTEC Cuplee, owned by Patricia Mendenhall; and her current competition partner Wentworth, formally owned by Amy McIlwham. Collier rides with Paralympic Dressage coach Wes Dunham of Woodstock Stables in Millbrook, NY. Her athletic pursuits have been accompanied by multiple awards and scholarships including 2011 Para-Dressage demonstration rider at the Adequate FEI North American Junior and Young Rider Championships, 2012 Think Alive Grant, 2013 USDF Youth Convention Scholarship, 2013 U.S. Para-Dressage Symposium invitation, 2013 Custom Saddlery Rising Star Award, 2013 Miss Jane Marple Memorial Trophy at Dressage for Kids, 2014 Michigan Virtual High School Chemistry Scholarship, 2013 and 2014 Jonathan Wentz Memorial Scholarship, 2014 Courtney’s Quest Scholarship, and the 2014 Women’s Sports Foundation Travel and Training Grant. Between riding and maintaining her Honors student status at Skyline High School, Collier enjoys sharing her story and goals as a motivational speaker around the country. She not only speaks to groups and individuals in the equestrian world but she also enjoys speaks with groups with varied interests throughout the community including 4-H clubs. Collier is excited to look towards the future as she aims for the 2016 Paralympics in Rio de Janeiro. For more information about Sydney Collier, please visit www.SydsParaQuest.com. Ellen DiBella purchased her first Morgan horse in 1972. She saw Morgans used in the rehabilitation program at FAMC with the amputee and paraplegic veterans from the Vietnam War. One gelding somehow became multiple Morgan horses. DiBella currently has eleven Morgans at home in Colorado and three in training. She also shows a number of Morgans and she enjoys the challenge of competition and the daily care of the horses at home. 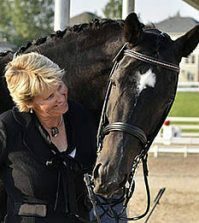 She has served on many boards of equine organizations ranging from local horse clubs, to the board of directors of the American Morgan Horse Association, to the board of the United States Equestrian Federation, to the board of trustees for the American Morgan Horse Institute. She has worked on show committees at all levels including seven years on the Morgan Grand National Committee which puts on the World Championship show for the Morgan breed. She currently serves on the board of the Colorado Horse Park and helped to found the Rocky Mountain Cancer Center Foundation which provides financial assistance to cancer patients and their family in meeting the expenses of living while fighting cancer. Visit www.sunrise-morgans.com to learn more about Ellen. Visit the Western Dressage Association of America at www.westerndressageassociation.org.